Welcome to Episode #20 of the Living Homegrown Podcast! Now that it is mid-August, the weather is making my kitchen very hot. Too hot! I just don’t feel like canning. So this episode is all about beating the heat with…Refrigerator Pickles! Yeah! This makes 2 quarts of pickles. These are NOT processed in a canner and must be refrigerated and eaten within 1 month. Trust me, that is not a problem. They are so good, they usually are eaten up in a week! In a large glass jar, layer the cucumbers and onions (alternating the layers). In a medium saucepan, combine remaining ingredients. Heat to a simmer, stirring occasionally until the salt is dissolved. Turn off heat and pour the brine over the cucumbers. Allow the mixture to cool on the counter for an hour and then transfer to the refrigerator. Wait three days and start eating! Keep all left overs in the refrigerator and use within one month. Note: You can also listen to this podcast in Stitcher. 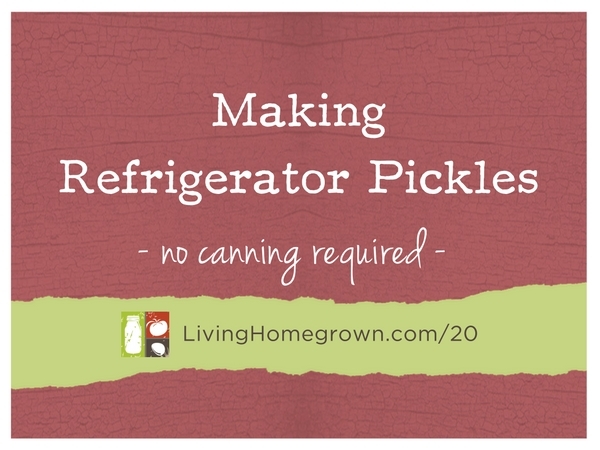 Have you made refrigerator pickles before? Do you have a favorite recipe?